Cats that show aggression to other animals have a 5 times higher chance of being relinquished by their owners than those who do not. Is your cat biting or scratching you, stalking and pouncing on you? 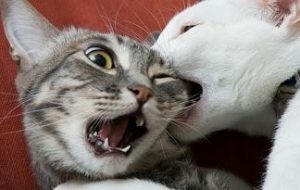 Is he biting you after you have been petting him for a short period of time or after you touch him in a certain place? 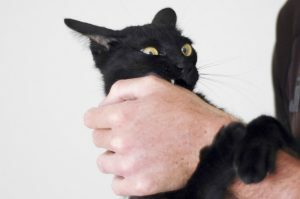 Don’t despair: There are ways to deal with aggressive behavior in cats. 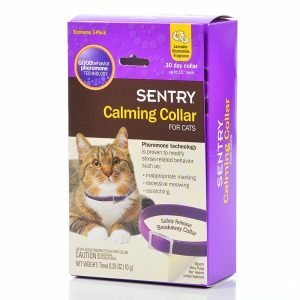 Below are some general recommendations for dealing with feline aggression problems. Before treating your cat’s aggressive behavior at home, make an appointment with your veterinarian. Occasionally, medical problems that can cause pain or irritability will lead to aggression; treating these conditions may resolve the behavior. Some displays of seemingly aggressive behavior are actually normal ways for cats to communicate. Cats use behaviors such as biting, scratching and pouncing to tell other cats that they do not wish to interact, to protect their territory or valuable possessions (including food), and in play. Cats may hurt people or other animals simply because they do not know how to play appropriately. 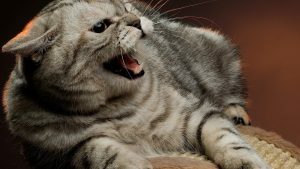 However, if your cat is beyond of that, growls and hisses to you in an undesirable manner, your cat may need to be taught more desirable ways to interact or you may need to help him become more comfortable in certain situations. Fear. Sometimes the best offense is a good defense! This is true of our fearful cats. When a cat feels threatened, they may act in ways to defend themselves. This is the most common type of aggressive behavior, so keep in mind that the goal when you’re developing a behavior modification plan is to make your cat feel comfortable, not threaten them further. Play and excitement. Some cats have a hard time distinguishing between appropriate and inappropriate play. Forms of play that may be appropriate with their litter mates may make us bleed. These cats often have difficulty controlling themselves and may not have learned the self-control necessary to regulate their play before it causes injury. Have you ever been so upset with someone at work that you go home and yell at a family member? That’s called redirection: You can’t take out your frustration on who or what is upsetting you so you pick on someone else. Cats sometimes do this, too. Dislike of petting. Some cats show a high sensitivity to being petted in certain places, and their annoyance can flair up in an instant. For example, some cats behave aggressively when touched on the rear end or when being petted while sitting on someone’s lap. The reasons behind this behavior are not well understood, but these cats sometimes learn to accept petting for short amounts of time. Pain and sensitivity. Numerous medical conditions can cause pain and discomfort. Just as we might lash out to protect ourselves from pain or anticipated pain, cats do the same. Early intervention is best, before your cat’s aggressive behavior becomes a habit. Physical punishment, even a light tap on the nose, increases your cat’s fear and anxiety. Some cats may even see it as a challenge, and become more aggressive. Certain medications can help, but only in conjunction with behavior modification and environmental changes. 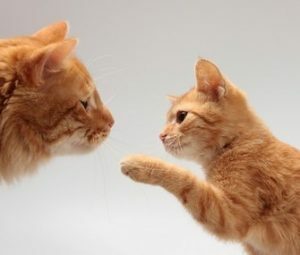 Recognizing the signs of aggression, then startling your cat without making physical contact are effective in curbing most aggression problems. Whenever possible, avoid situations that increase your cat’s aggression. Separate cats that have aggression issues and re-introduce them slowly. Food treats can be used to effectively reward non-aggressive behavior. Are you trying to figure out how to handle cat aggression towards other cats? 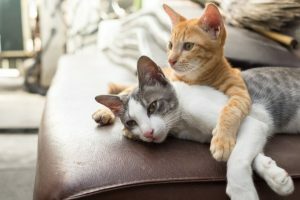 If your cats suddenly start fighting when they previously lived together without altercations, the first step is to take them both to your veterinarian for medical evaluation. Medical problems can cause a cat to be in pain, grouchy or confused, which increases the likelihood for aggressive behavior. 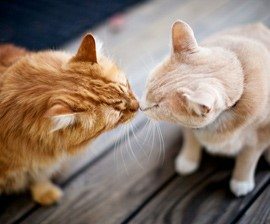 If a medical evaluation reveals no abnormalities, the following recommendations may help your cats to resolve their differences. These recommendations will also be helpful for cats who have been introduced to each other recently and are not getting along. The first step is to separate the cats from each other completely — in separate areas of the house. Do not allow them to paw at or smell each other through a door. If they must be in adjoining rooms, place a barrier at the bottom of the door. Ideally, though, you should confine them in separate parts of the house where there is no opportunity for contact. Provide each cat with food, water, a litter box, a comfortable place to sleep, and regular interaction with you (playing and/or petting). It is very important to make certain that you are providing each cat with enough exercise and playful interaction. Oftentimes, fights occur when one cat wants to play and the other cat doesn’t. Providing the playful cat with enough exercise can eliminate the problem. Next, think about the “triggers” that might be causing the fights. For example, your cats may fight when both want attention from you, or they may fight over preferred resting places, or they may fight when they see another cat outdoors. Before you reintroduce the cats (see below), create a plan for how to minimize the triggers that cause fighting. If the cats primarily fight over resources, such as access to food or resting places, provide them with abundant resources. Since a cat will find it much more difficult to guard four food bowls rather than one, aggression is much less likely to occur if you provide more bowls. If the cats attack each other after seeing another animal outdoors, block visual access to the outdoors. Opaque “wallpaper for windows” works well in this situation. If the cats are fighting over access to and attention from you, you can teach them that this behavior is not rewarding, that it drives away your attention instead. You can do this by paying close attention to the warning signs of anxiety and aggression, which include dilated pupils, growling, a direct stare at the other cat, tense body posture, and a swishing tail. When you see these signs, get up from what you are doing and leave the room. The cats will be left with nothing to fight over. It is crucial that you leave the room at the first signs of anxiety. If you wait too long, the cats will be so aroused and upset that your presence will no longer be important; they will fight despite the fact that you are no longer in the room. If you are unable to recognize the early signs of an altercation, do not attempt this technique. Another technique you can use to prevent a fight is to teach the cats to come when called. When you see signs of anxiety, you can call them to you and reward them for their good behavior. Keep a box handy containing special toys or treats that your cats really like. After calling the cats to you, play with them individually or give them each a food reward. Teaching a cat to come is fairly simple. At every mealtime, when you start going toward the area where the food is located, say “[kitty’s name], come.” Your cat will soon associate mealtime with the word “come.” After one week, start saying “come” at random times during the day. When your cat comes, give her a special treat or play with her with her favorite toy. Practice several times per day. You are teaching your cat that when you give the cue “come,” she is always rewarded. She learns that it is much more worthwhile for her to come to you than to fight with the other cat. Make sure that you always reward her when you call her and she comes to you. After you have decided what technique to use to prevent aggressive incidents, it is time to reintroduce the cats to each other. Start by allowing the cats some access to each other. Situate each cat on either side of a door adjoining two rooms and let them smell each other through the crack at the bottom of the door. Next, feed each cat a small bowl of special food (such as canned food or a small amount of tuna) within about five feet of the door. After the cats are eating for a few seconds, open the door between the rooms. If the cats show warning signs of aggression, close the door immediately and remove the food. Wait a while before you try again and when you do, start with the food bowls further away from the door. The more frequently you are able to do this exercise, the more quickly your cats will progress, but aim for a minimum of twice daily. Over time, move the cats closer to the door, until the cats are able to eat side by side without behaving aggressively. You are teaching them that good things happen in each other’s presence. After two to three weeks of feeding exercises with no aggression, you can start allowing the cats direct access to each other, with your supervision. Keep each room of the house equipped with special toys and treats. If the cats show warning signs of aggression, distract them, redirect their attention toward you, and take note of when and why the behavior occurred. Remember that mild aggressive displays, such as hissing and then walking away, can be normal when two cats have not seen each other for several weeks. Aggression is a form of communication and is not necessarily bad as long as the cats are simply listening to each other’s communication, and are not fighting with each other. If these techniques do not solve your cats’ problem, please seek the help of your local shelter, a veterinarian, or a behaviorist. Be patient. It takes time for cats to learn how to behave aggressively, so it will also take time to teach them that you do not want them to behave that way. In most cases, providing them with adequate playtime and social interaction and learning how to head off aggressive incidents will resolve the problem.